These are our next door neighbors' kids, who stopped by for trick or treat last night. If I had a kid, I would insist that blackbeard makeup be part of his everyday ensemble. Well, I just ran out of candy at my place (had four left and then a group of five came to the door. Darn.) 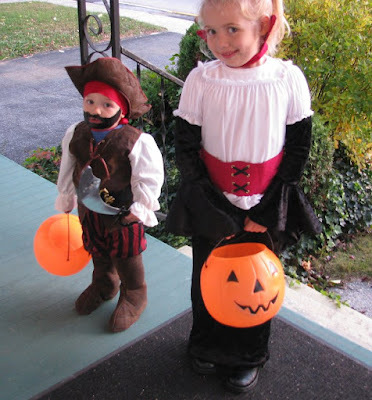 and although I totally agree that that is a thoroughly fetching blackbeard outfit, I find myself wondering why these two came by for trick or treat last night. M.Mike— it seems like trick or treat night is celebrated on any night except for Halloween in U.S. Not sure when or why that happened. Sorry you ran out of candy. I always buy way too much (some for the kids, some for me). But this year I made myself buy candy that I don't like, so we have plenty leftover! Second, did young Edward Teach politely ask for candy or demand it in true pirate fashion? Something like, " ARRRGH Pass over the candy or I'll have yer guts for garters and the scuppers will run with yor blood ya lubber!" This reminds of the the story of the boy who dressed as a pirate for Halloween, an older lady met him at the door and exclaimed "Oh a pirate! and where are your buccaneers? He replied "Under my buckin hat!